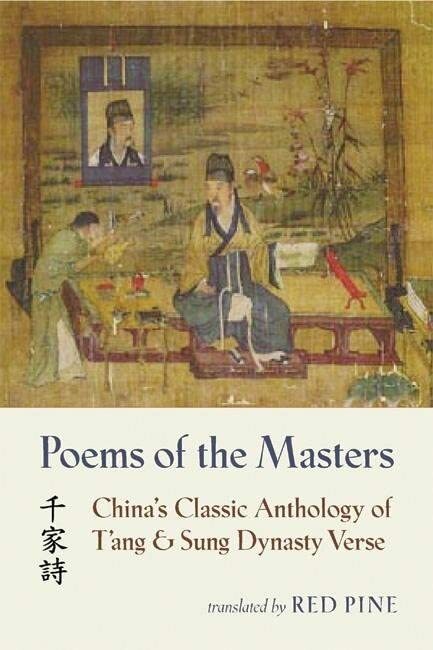 [PDF] Poems of the Masters: China's Classic Anthology of T'ang and Sung Dynasty Verse (Mandarin Chinese and English Edition) | Free eBooks Download - EBOOKEE! Description: Poetry is Chinaâ€™s greatest art, and for the past eight centuries Poems of the Masters has been that countryâ€™s most studied and memorized collection of verse. For the first time ever in English, here is the complete text, with an introduction and extensive notes by renowned translator, Red Pine. Over one hundred poets are represented in this bilingual edition, including many of Chinaâ€™s celebrated poets: Li Pai, Wang Wei, Tu Fu, Wang Po, and Ou-yang Hsiu. Poems of the Masters was compiled during the Sung dynasty (960â€“1278), a time when poetry became the defining measure of human relationships and understanding. As Red Pine writes in his introduction: "Nothing was significant without a poem, no social or ritual occasion, no political or personal event was considered complete without a few well-chosen words that summarized the complexities of the Chinese vision of reality and linked that vision with the beat of their hearts . . . [Poetryâ€™s] greatest flowering was in the Tâ€™ang and Sung, when suddenly it was everywhere: in the palace, in the street, in every household, every inn, every monastery, in every village square." "Chiupu River Song" by Li Pai My white hair extends three miles the sorrow of parting made it this long who would guess to look in a mirror where autumn frost comes from "This valuable text will help us appreciate the richness of poetic imagination and experience. "â€”Book Magazine, five-star review "[Poems of the Masters] includes the Chinese originals, along with commentaries on imagery, various social conventions, historical backgroundâ€”all absolutely essential to a full appreciation of the texts... the best way to approach them is to pick one out and let it drop like a pebble into the well of your mind and hear how it resonates. "â€”The Philadelphia Inquirer "The poems in this remarkable anthology speak to usâ€”across an immense distance of time and spaceâ€”of loneliness, beauty, the consequences of political action, the stillness of autumn. Red Pine's wonderful translations and the clarity of his accompanying notes make these poems accessible and intimate to all of usâ€¦Red Pine and the good people at Copper Canyon deserve a place in the Taoist paradise for bringing us this beautiful book. "â€”Booksense Recommends Red Pine is one of the worldâ€™s most respected translators of Chinese literature, bringing into English several of Chinaâ€™s central religious and literary texts, including Lao-tzu's Taoteching (isbn 9781556592904) and The Collected Songs of Cold Mountain (isbn 9781556591402). No comments for "[PDF] Poems of the Masters: China's Classic Anthology of T'ang and Sung Dynasty Verse (Mandarin Chinese and English Edition)".